An appeal to Scottish sheep farmers to work with butchers and supermarkets to promote the home consumption of lamb was made by former Scottish Sheep Farmer of the Year Joyce Campbell when she officially opened NSA Scotland’s Highland Sheep event at Kinnahaird Farm, Strathpeffer, Ross-shire. Farmers Guardian reports. MS Cambell, who runs a flock of 780 Lairg-type North Country Cheviot ewes on her 2,322-hectare (5,600-acre) hill farm at Armadale, Sutherland, deplored the abysmally low consumption of lamb in Scotland at 2-2.5kg per capita compared with 7.5kg south of the border. She called on butchers’ shops and supermarkets in particular to display recipes outlining how to cook different cuts of fresh lamb. Highlighting the importance of sheep to the agricultural economy, particularly in the north of Scotland, Ms Campbell said it was ironic the arrival of Cheviot sheep into the Highlands had triggered the Highland clearances in the 18th and 19th centuries, when hundreds of crofters had been driven from their land as it was the same sheep on which the area’s future survival depended. 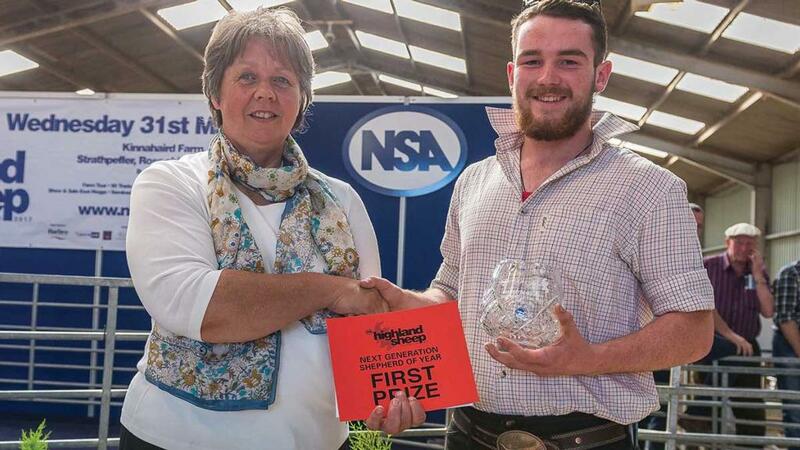 Ms Campbell has emerged as a champion of the sheep industry in Scotland since winning the Sheep Farmer of the Year title in 2015 and makes wide use of social media to promote the merits of sheep farming and encourage lamb consumption. Her efforts were further recognised at NSA Highland Sheep when she and her team, which includes husband, Ian Macleay, an auctioneer with Aberdeen and Northern Marts, and her niece and nephew, Frances and Mure Grant, were presented with one of the Scottish sheep industry’s highest accolades – NSA Scotland’s silver salver awarded in recognition of outstanding contribution to the sector. Ms Campbell’s comments were strongly supported by John Fyall, chairman of NSA Scotland, who said the public needed to be made aware the sheep industry was worth protecting and growing. The event was hosted by mother and daughter Dorothy Clark and Amy Grant, who run a flock of 350 Texel cross ewes and 160 suckler cows at Kinnahaird. Features of the event included a farm tour. The first prize pair of Blackface ewe hoggs sold for the top price of 700gns each at the special show and sale conducted by Dingwall and Highland Marts at NSA Highland Sheep. The April 2016-born pair, by a £35,000 Dalchirla and an £11,000 Auldhouseburn, were consigned by Archie MacGregor, Allanfauld, Kilsyth. The successful phone bidder was Stephen Small, Ballymena, Co Antrim, Northern Ireland. Second top price was 550gns each for the winning pair of Suffolk hoggs by Essie Ugie and Essie Ulysses from Irene Fowlie, Strichen, bought by Louise McAuley, Fochabers. Judge Robert Paterson, Upper Auchenlay, Dunblane, awarded the championship to Jim Simmons, Kirkmichael, Ballindalloch, for a pair of Mule hoggs which sold for 160gns to Derek Campbell, Leverburgh, Isle of Harris. Former world champion sheep dog handler, Michael Shearer, Thurso, Caithness, won the invitation sheepdog trial. Mr Shearer, who won the world championship when it was held at Fearn in 2014, took top place with his dog Roy. The five leading dogs in the competition during the morning competed in a novel double lift in the afternoon, a contest usually held only in international competitions, to decide the overall winner. Schoolboy phenomenon Joe Mackenzie, Turriff, was placed fourth overall and won the under 21 section. Open, 1, Sandy McCarthy; 2, Dora Smith; =3, Dorothy Edward, D Budge, and John Swanson. Young farmers, 1, Emily Stephen; =2 William Moir and Ellis Mutch. Under 18, 1, Jamie MacKinnon; =2, Stephen Forbes: 3, Reece MacLeod. Breed societies, 1, North Country Cheviot; 2 Blackface Sheep Breeders Association; 3 Beltex Sheep Society. 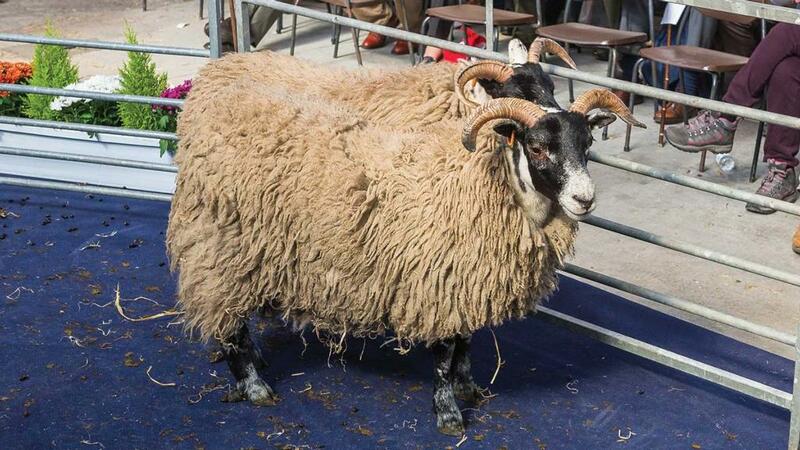 Indoor, 1, Harbro; 2 Logie Durno Sheep; 3 NSA Scotland. Outdoor, 1, Scotpen; 2 Trailer Solution; 3 Niall Bowser, Livestock Equipment.